An overwhelmingly beautiful diamond circle emerges deep in the black sky, stars shine, and a 360˚ horizon surrounds us. A universe reveals itself. Total, Totality, Totally. A universe that is alive. The moment, for me, defies description, explanation, photography. And then it’s gone. The sun shines again. Brilliant. I knew that a solar eclipse would happen August 21 2017. That millions of people would be there to watch. That the crowds would be massive. I didn’t plan on joining the masses of crazy solar eclipse viewers in the Path of Totality even though our youngest child lives in Victor Idaho, on the centre line, with her family. I would read about it instead, and then watch it on the news. I began to read. Globe and Mail. July 31, 2017. “Into the Shadow” by Ivan Semeniuk “A total eclipse is one of life’s genuine experiences. …a fleeting rare phenomena.” I am told. I start (too slowly I am about to find out) to search for safe shades for solar viewing. Calgary will experience a partial eclipse, 77%. Shades for safe solar viewing were sold out weeks ago. No Problem. I’ll buy them on line. I need those special shades for partial eclipse viewing. Not as easy to find as I had thought, they’re all sold out. Back ordered. Delivery not guaranteed. And then luck. There is a solar eclipse viewing kit for sale at All-Star Telescope. Ross drives 75km to a farm near Carstairs to pick it up. The last of the solar viewing glasses. We can now view the partial eclipse safely from our home in Calgary. I don’t have time. I tell myself. I’ve had a wonderful summer travelling and visiting with family and now that I’m finally home my week here is too busy. I have work to do. Seventy- seven per cent eclipse here at home will have to do. “Okay. That’s it. We have to get there.” I know what Ross will say. “We’ll just cancel all our appointments.” I continue. “Wow! Yea! We’ll have a family Eclipse festival.” Erin says. Mike (our son) and his boys (our grandchildren) will be there too. I spend the rest of the day baking double chocolate chip cookies. Eclipse food. For the soul. Today I think a lot about Syrian children. There are 8.5 million of them living in unspeakable horror and desperate need in Syria and surrounding countries. Some are victims of the worst forms of child labour in armed conflict and sexual exploitation. I hope that in 2016 Syrian children will have a safer place to live, be well nourished and healthy, be able to learn to read write and count and grow up to be responsible and caring, like those we met in the desert fifty years ago. The battered old aluminium coffee pot filled with warped wooden gadgets that you see on my kitchen counter is special. One night we almost used it as a weapon. And so we set off anyway. The Beetle bumps across a furnace of connected deserts and oasis towns. Everything around us is flat. Hard brown sand glistens like diamonds under a fireball sun. I read that Gertrude Bell wore heavy wool to keep the sun out when she crossed this desert on a camel during the First World War. So did Lawrence. We wear bath towels. Heavy, brown, wet ones. Wet towels over our heads, wet towels over our shoulders and wet towels across our laps. And then we jam wet, brown towels into closed car windows to keep the hot blast of desert air out and block the burning sun. The sun. The heat. The emptiness. There is so much of nothing here. It is cooler now, the evening is beautiful and still. A massive orange sun seems unreal to us, as it slowly sinks into the sand. So here we are. This is the Great Syrian Desert and, like Lawrence of Arabia and Gertrude Bell, we are on our way to explore Palmyra. Sand, the colour of nicely ripe peaches, is all around as far as we can see. The heat of the day dissipates as the sun lowers. Dusk begins to settle in. The moon brightens, stars begin to break through day into night, first one, then two, and now a few more. It reminds me of the Christmas story. We unfold the little Danish wooden camping table, smooth on the red and white plastic tablecloth, set out our shiny stainless steel cutlery and our brown stoneware coffee cups from Finland. The new Italian coffee pot is popping, sputtering and exploding, gathering pressure on the little diesel-fuelled camp stove set in the sand. Soon we will have a nice cup of coffee. We have not forgotten to bring all the trappings, of what, we think, is civilization. “Do you see that?” Ross says, pointing to the darkening night in the east. Black and ghostly, the apparition gathers momentum in a storm of swirling sand. “It’s coming toward us. It’s someone on a horse, ” Ross stammers in disbelief. Long, flowing, black robes fly in the wind behind him. He holds a wooden staff in his right fist. He raises his arm high. Like a scene from Lawrence of Arabia he is fierce and relentless in his gallop toward us. Months ago we discussed carrying a weapon. Most people we spoke to, who crossed this desert, carried a gun for protection. We thought about it and decided that if anything bad happened we would be too scared and inept to shoot anyone. They would shoot us. With our gun. Now here we are. Scared. Inept. But keen to live. The coffee pot will have to do. In an explosion of sand, the man reins his horse to a high-speed stop beside us. The coffee pot is poised, ready for action. But wait a minute. 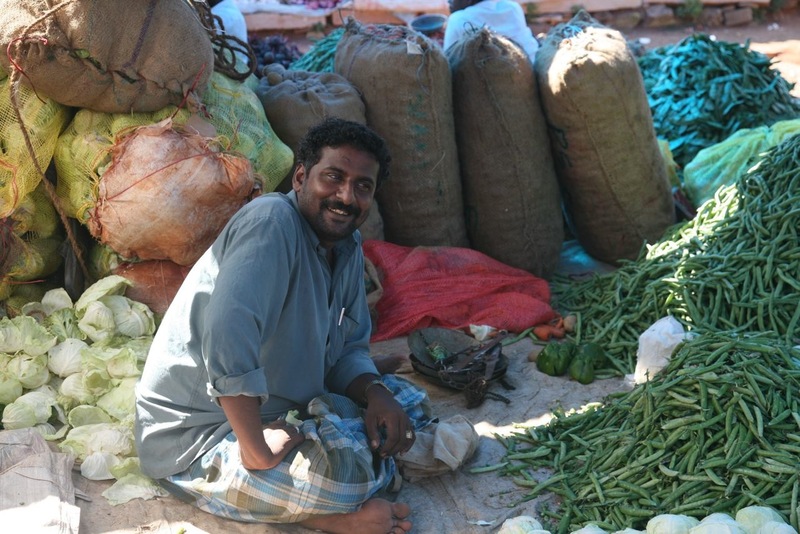 The Bedouin’s turban frames a kind, smiling face. “Salaam Alaikum.” Peace to you, he says softly. The Bedouin smiles broadly again and says something we don’t really understand, shoots his arm high in the air, waves and charges off into the empty, bleak desert. We are stunned. After a moment we collapse in laughter. At ourselves. “He’s going somewhere fast. Probably home for supper,” Ross says. Relief and happiness take over our fear as we lay down in the sand under the stars. The morning is cold but the sun is beginning to soar and we know we will be in the furnace again soon. We pack up our little home in the desert and get in the car to leave. There he is again. Children are with him, three boys, about ten or twelve, laughing and jostling one another, each on his own magnificent horse. They grind to another one of those high-speed horse stops in a cloud of sand, and the man, smiling broadly, gestures that these are his children. Apparently they have something special for us. With dad’s coaching, they shyly present us with a present. Three freshly picked watermelons. Their gift has warmed my heart for a lifetime. And I will never throw out that coffee pot. This morning I drove from Canmore to the Banff Centre down the Trans-Canada highway. The road was lined with bright yellow aspens. The sun cast a hue of golden magic on Cascade Mountain. I was thinking about telling you my story about the Silk Road, the little boys, the watermelons and our coffee pot. Neil Young was singing on the car radio. Was it by chance for me? These expressions keep me searching for a heart of gold. * Young, Neil. Greatest Hits. Heart of Gold. Reprise records, 2004. We are staying in Nagarhole National Park part of the vast Nilgiri Biosphere Reserve that covers 5000 square miles across the states of Karnataka, Tamil Nadu and Kerala in southwest India. To me it is wonder of human achievement that this park exists in the second most populous country on earth. 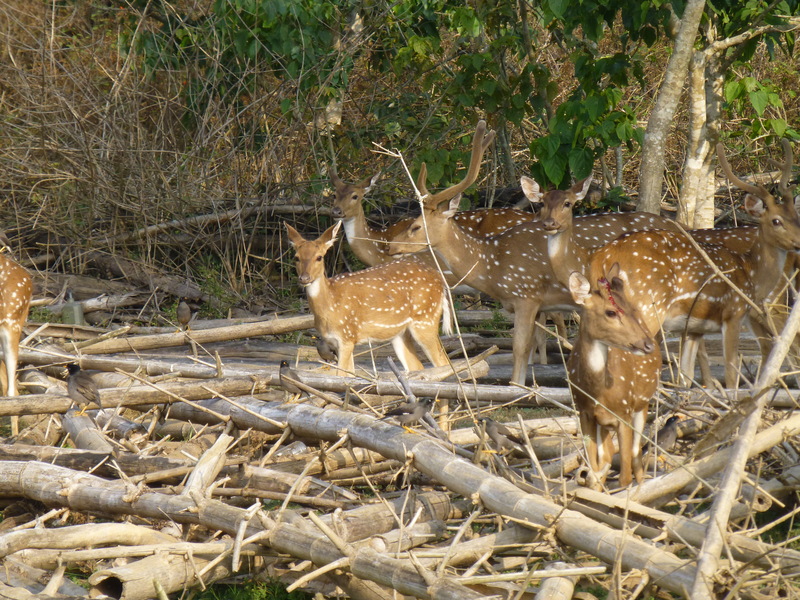 It is habitat for over 100 different mammals including the majestic Bengal Tiger, Asiatic Elephant and Leopard. 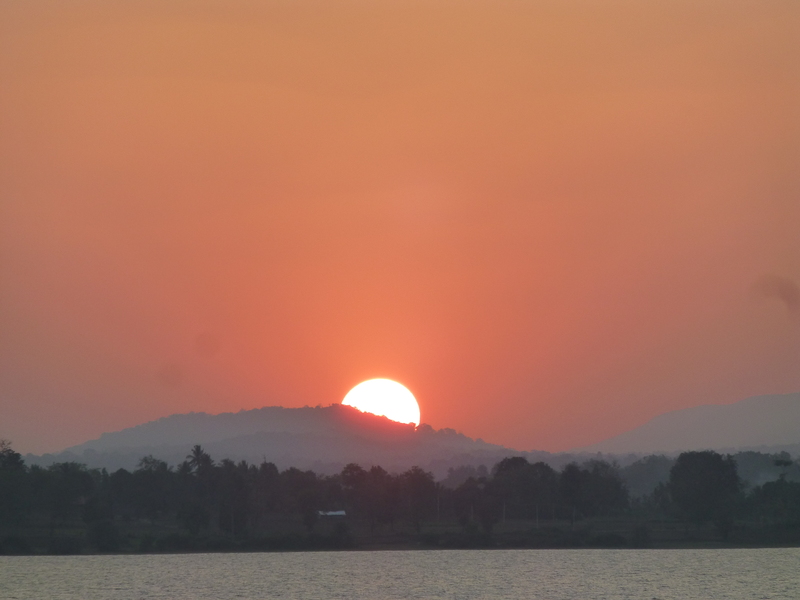 It is late in the afternoon and we’re taking a water safari on Kabini Lake. It is calm, quiet and beautiful; the boatman cuts the motor often to stop and listen to the forest. Our guide, a certified parks naturalist, assures us that the animals go into the forest during the hot daytime hours but now that it’s cooler we have a chance to see some when they it come out to the lake to drink. 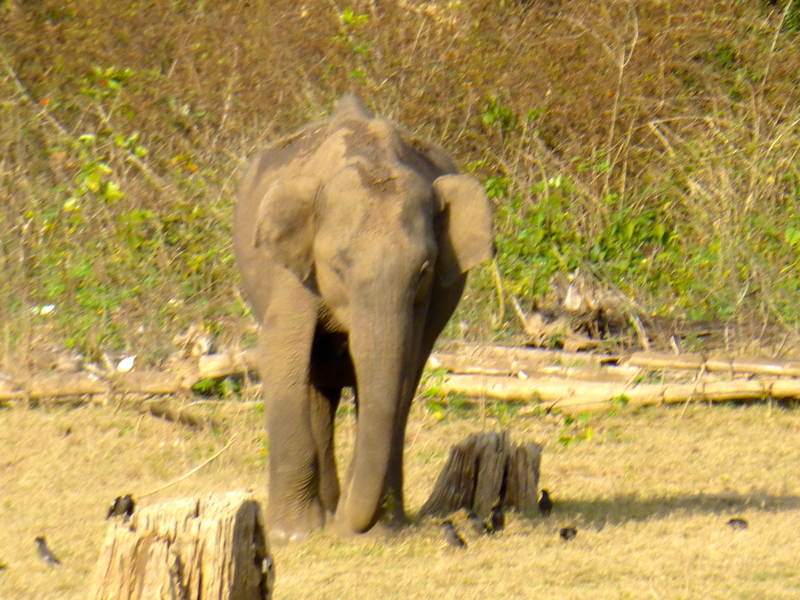 We see hundreds of gentle, sweet-looking spotted deer, several huge gaur, wild pigs, lots of langurs (a large Old World Monkey with a very long tail) capering in the bamboo, a few elephants and a crocodile basking in the late afternoon sun. But wait a minute. Do you hear that? That is an alarm call. The monkeys are warning that danger is near. Now the forest is silent. 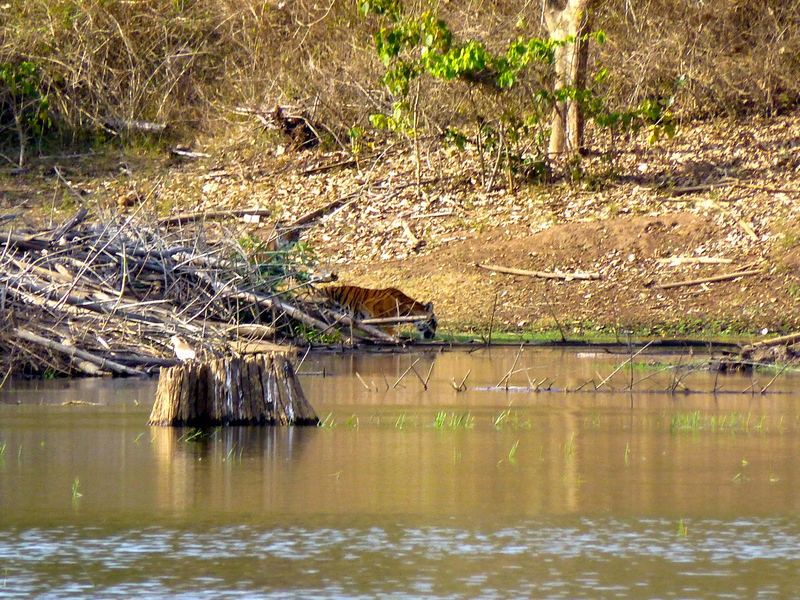 A tiger peeks out of the bamboo, takes a few steps into the river to drink. Then her eyes meet ours. And she slinks back into the forest. 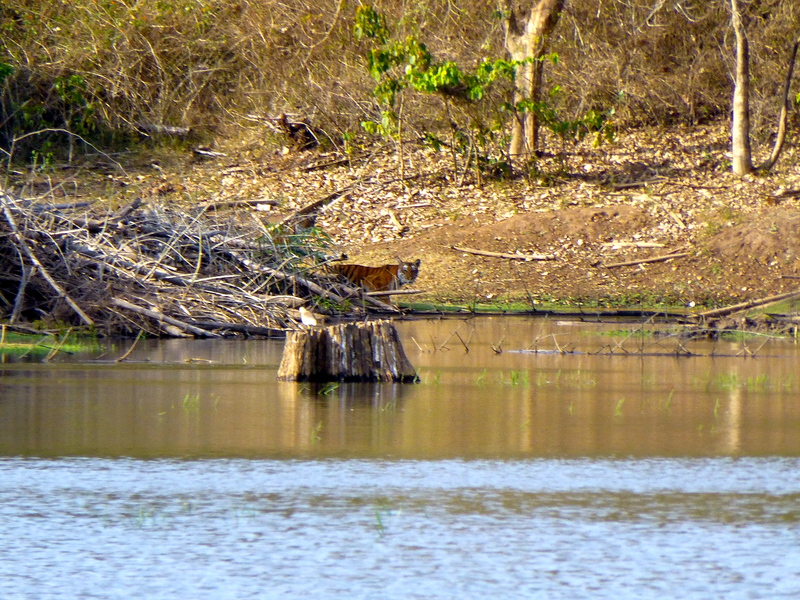 It’s thrilling for me to see a tiger in her natural setting but it is even more exciting to know and understand the natural environment she thrives in so that we can work toward preserving her natural space. We return to our lodge full of awe. The sun is setting. 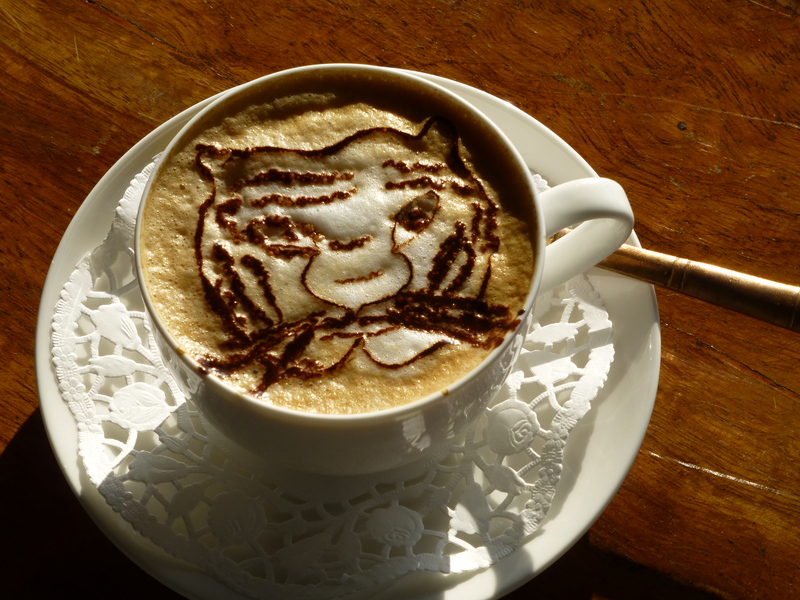 The barista in the reading room overlooking the lake is very happy that we have been able to see a tiger. He shares his enthusiasm for conservation in Nagarhole National Park and makes us an unforgettable cappuccino to celebrate an unforgettable day. 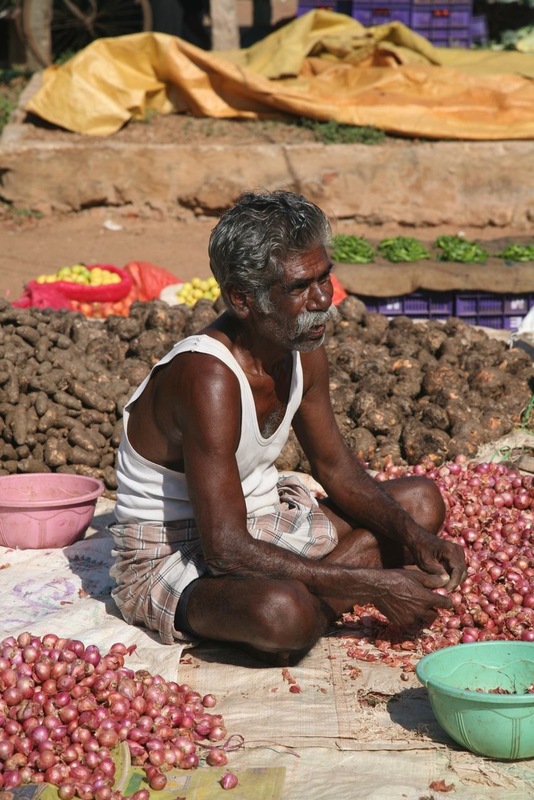 “One is lucky to eat like a Chettinar” Ancient Tamil saying. I bought the book that day and it is exquisite. 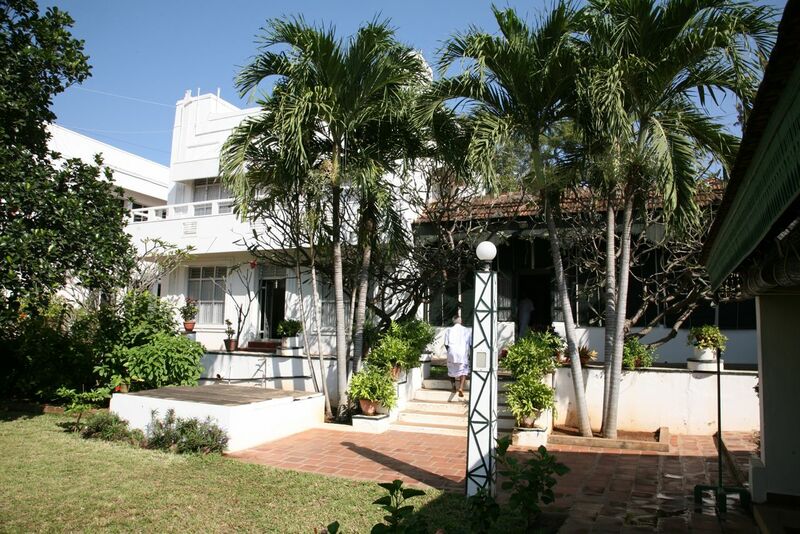 The Bangala is a small heritage hotel in Karaikudi one of seventy-six Chettinad villages deep in rural South India. And I will never forget it. Ross and I arrived late for lunch our first day after a long, bumpy, hot drive through rural Tamil Nadu. Nothing prepared me for the feast of senses I was going to experience. A calm, refined woman, Umma, greeted us warmly and handed us cool wet towels to freshen our hands and faces, served us tall glasses of lemonade and then invited us to follow her to the lunch area on the porch. They had been waiting for us and our places were ready at a long table set with the traditional fresh banana leaf dishes. A gentle water fountain nearby soothed my road weary head and the sweet scent of jasmine and roses from the garden filled the air. Servers, dressed in soft flowing saris, padded by and serenely spooned, one by one, dollops of the most aromatic and delicately spiced culinary creations I have ever tasted onto my banana leaf–fish curry, chicken Chettinad pepper masala, spinach Masiyal, mixed vegetable Kootu, drumstick sambar, yogurt. Then side dishes arrived. Vegetable fritters, coconut rice, mango. I was in paradise or was it home? It’s true. Home is where the heart is and the Bangala captured my heart. Later Umma took us for a walk around Chettinad villages. We talked about food and values, culture and art, family and traditions. 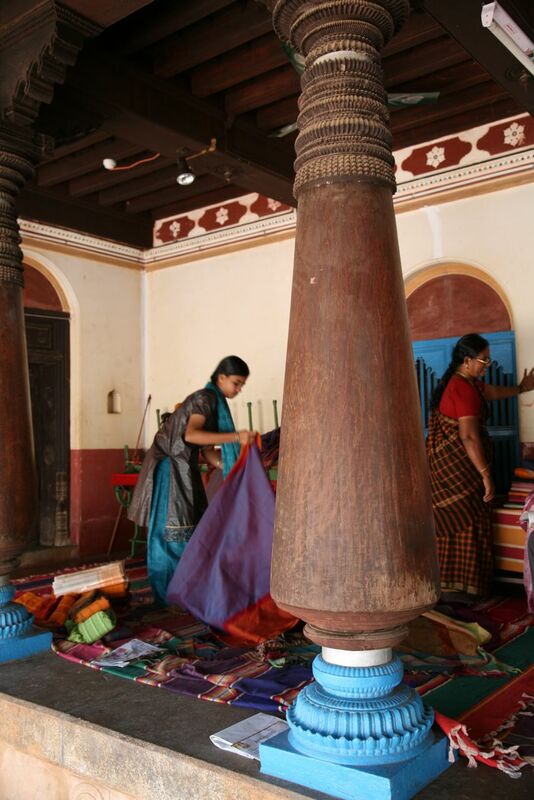 We visited a home where a Chettinar family wove vibrant checked and striped cotton saris. 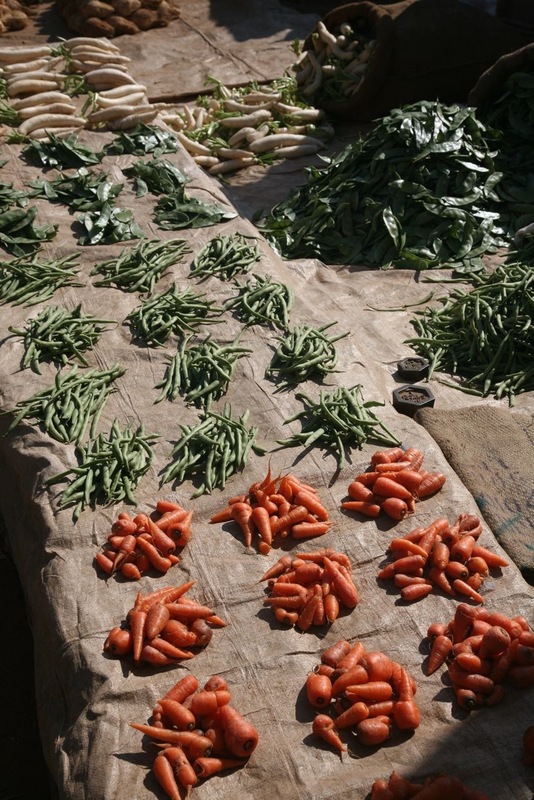 We shopped for vegetables and I bought a dozen tiny clay candleholders for Diwali in India or Christmas for us at our home in Canada. 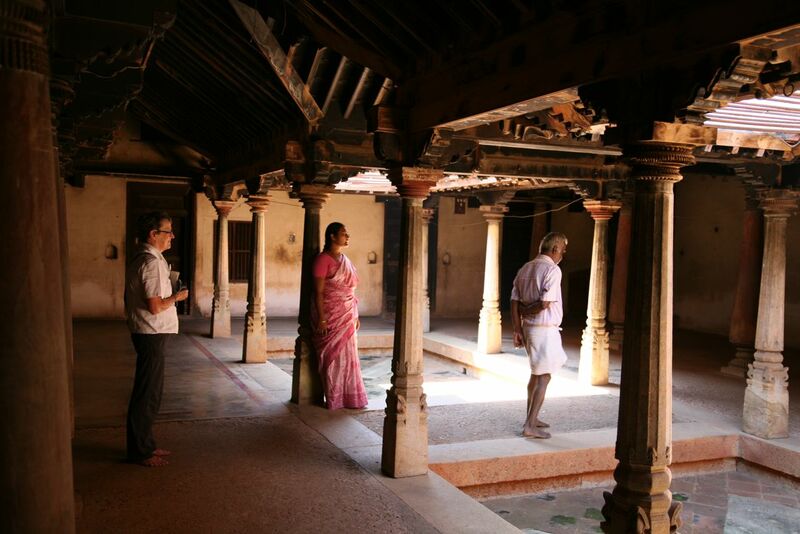 Chettinad is known not only for its fine master chefs and cuisine, but also for its architecture. 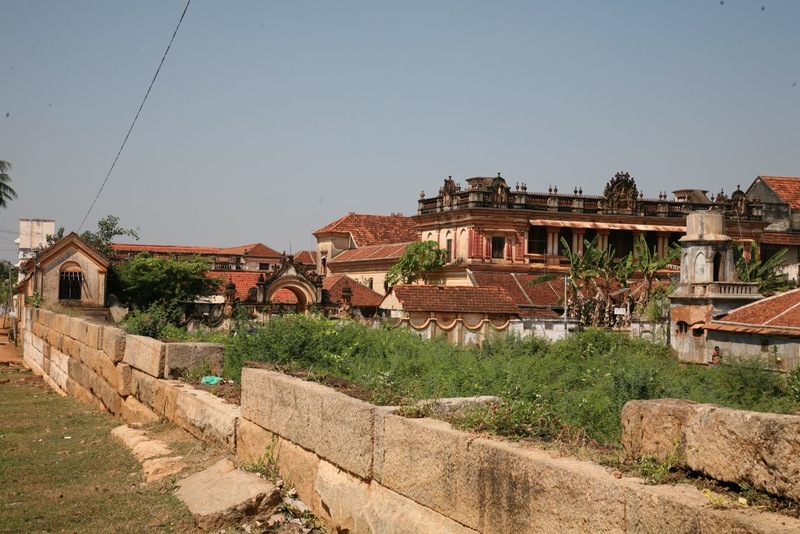 I listened to Umma’s stories about the eclectic historic palace homes we had never seen before that were built by Nattukottai Chettinar families. The palaces, ornately decorated with treasures–teak from Burma, coloured glass from Belgium, ceramics from Europe–reflect an exchange of ideas and merchandise that their trader/financier owners brought home from Burma, Malaysia, Ceylon and other parts of the world. 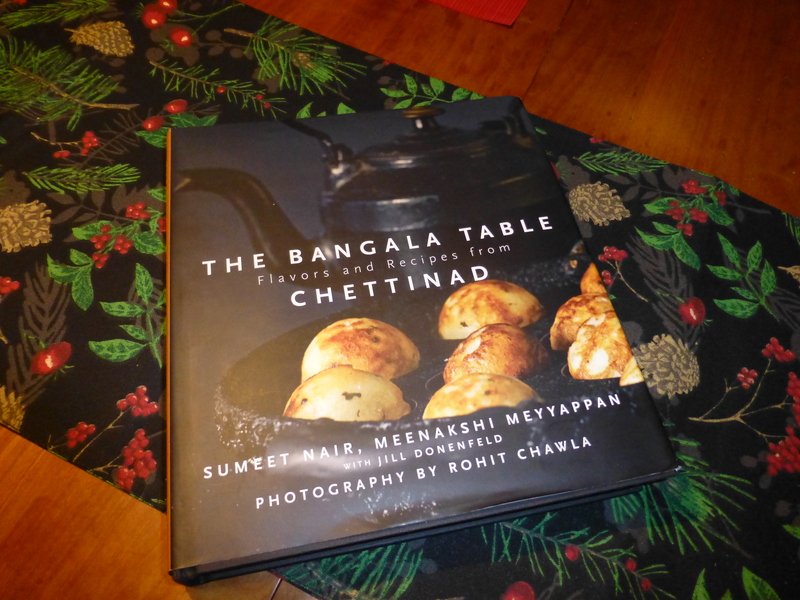 Now I too have a little piece of Chettinad to savour and treasure. The Bangala Table. Flavors and Recipes from Chettinad. The recipes, the photographs and writing are glorious. 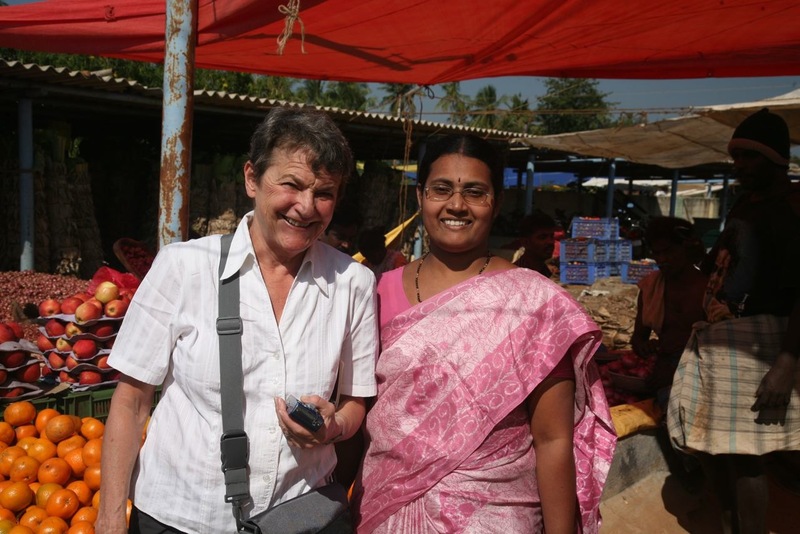 Thank you Meenakshi Meyyappan and all of you who worked hard to write this book and share your home with us. Benares is older than history, older than tradition, older even than legend and it looks twice as old as all of them put together.” Mark Twain 1897. I’ve lost Ross somewhere in the crowd but I’m determined to press my way alone through throngs of pilgrims, alms seekers, stretcher-bearers carrying covered corpses sadhus (holy men, most fake, some real,) locals and a few other stunned foreign travellers. The touts are aggressive and close. Too close. I turn my eyes away from them and whatever they shove in my face. A putrid stench rakes over me. I trip and slide around the garbage, some organic but mostly plastic. Plastic Bags. I do my best to dodge cattle dung, goat turd, dog poop and other unsavouries, including the plastic bags and what may be in them. Will it ever end? Damn. I nearly stepped in it again. There are too many tacky trinket stalls, too many people, too many piles of wood, too much smoke, too much of everything. I want to get out of here even though I’ve just arrived. So I ask myself. Why are you here, Nancy? What made you come? Where is the light in this City of Light you’ve finally come to visit? 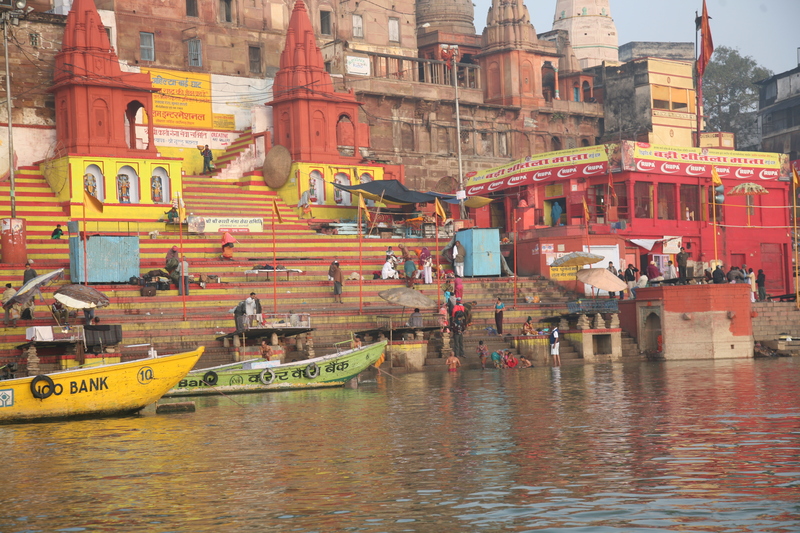 For thousands of years literary masters have written about Varanasi (called Benares or Kashi by locals.) The city has inspired composers and musicians; been painted and photographed by famed artists; explained by philosophers; and spoken about in mysterious tones by my friends who have visited. 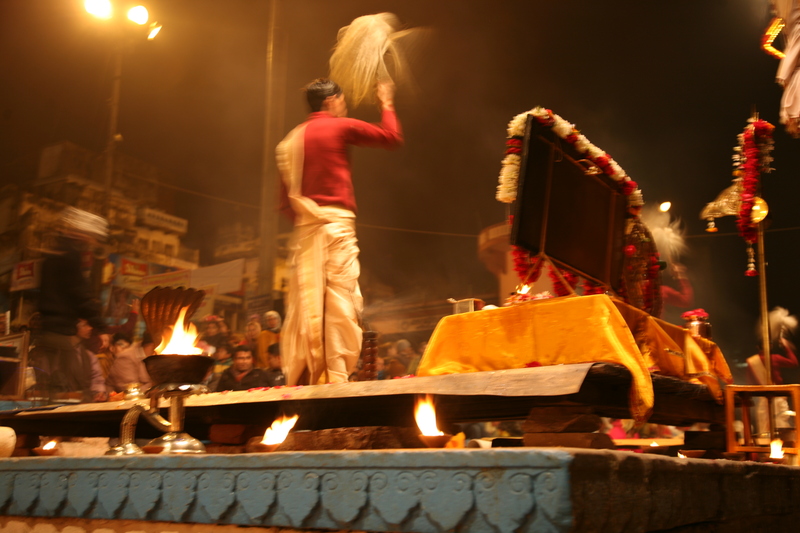 Varanasi is the zenith of the Hindu faith and is revered by Jains and Buddhists. So here I am. But nothing I have seen, read, heard or imagined has prepared me for it. Then, unexpectedly, the dark passageway opens up. There it is at the bottom of the steps. The River Ganges. It is wide and beautiful and shining in the low western sun. Along the broad stone steps, called Dasaswamedth Ghat, the Goddess River Ganga spreads out holding thousands of twinkling floating candles, rose petals and flowers. Eerie sounds of horns droning and symbols clanging resonate through the spaces. Smoke and the smell of sandalwood and incense drifts around everything. I take a deep breath and inhale the moment. The noise, the garbage and even the touts are obliterated. Ross comes out of the crowd and we stand at the top of the ghat. “I can’t believe I’m here,” I whisper. Our guide, Babalu, leads Ross and I down the steps. We work our way around small groups of musicians sitting crossed-legged around fires, chanting mantras as they play sitars and tablas. 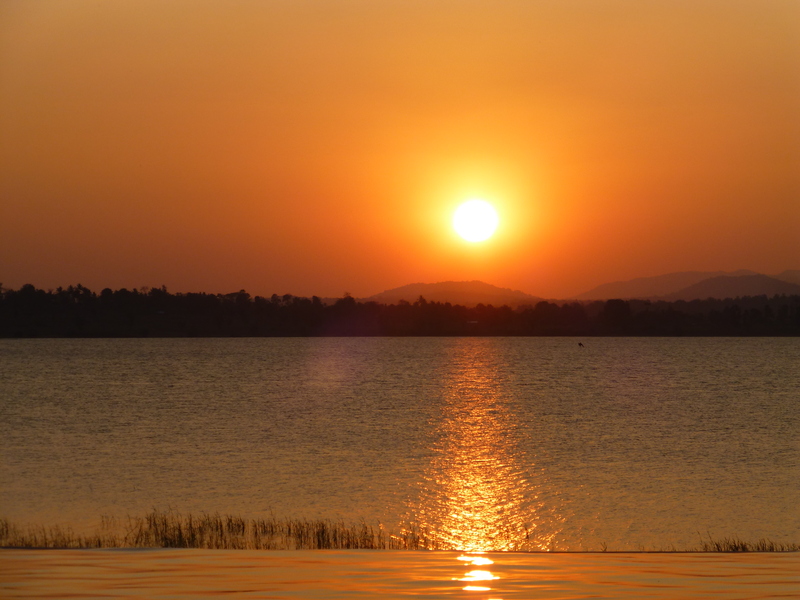 The sun will set in a few minutes and the Aarti Puja will begin, an offering to five great elements in the Hindu faith–fire, water, air, earth and the ether that is also known as space. “For thousands of years this is happening everyday.” Babalu expounds. “We recite the Om loudly and pray for all people, for the well being of all.” And then he lifts his head toward the sky, clasps his palms together and shouts in a loud musical bass voice. I shiver, memorized by the mystical hold of Mother Goddess Ganga. Ashish, our oarsman, holds our hands and helps Ross and me into his low-slung wooden boat so we can watch the Puja from the river. 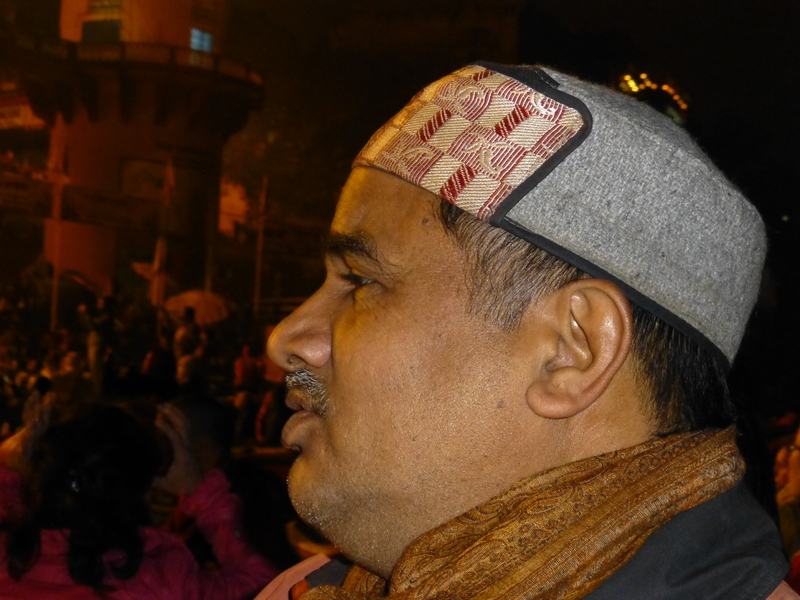 The ghats (there are eighty-seven in Varanasi) are busy tonight after days of rain and cold temperatures. 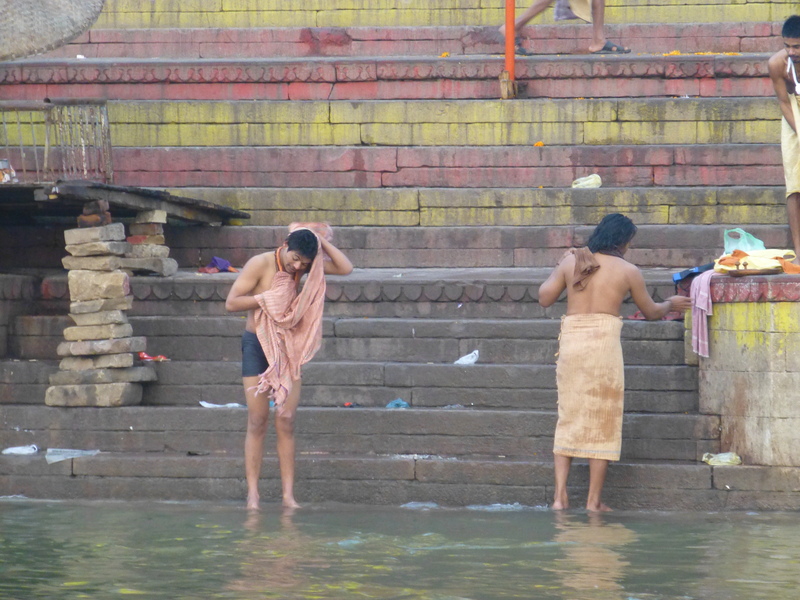 Thousands of people sit on the steps waiting for the Puja to begin; others, women in colourful saris and men in white dhotis, are bathing in the river, believing the Mother Goddess Ganga purifies the soul. I wonder what it would be like to be in the river beside them, but even though I want to hear their stories I hold myself back. 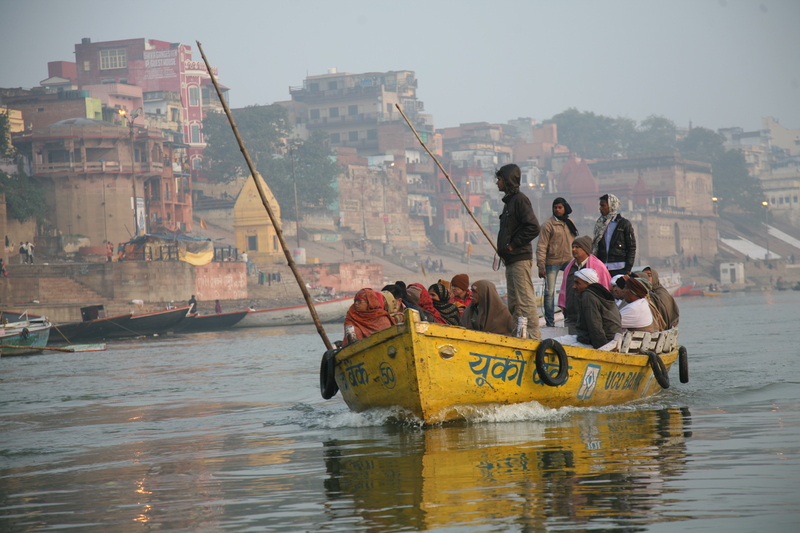 The Ganges is the fifth most polluted river in the world. Environmental efforts to clean it up have been a complete failure. So far. 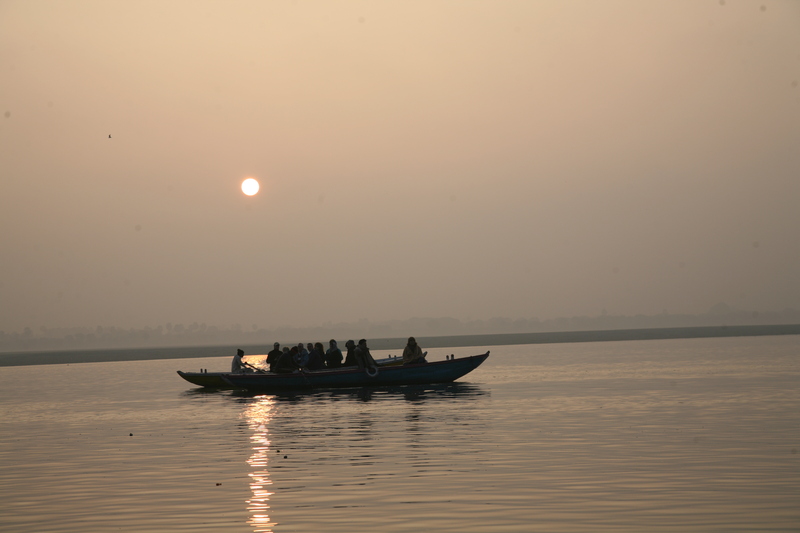 The jet-black boat we’re in slithers through floating grime and slowly moves down the Ganges. It has lost its glow now and is black like the night sky. The intimate rituals of life are close and very public. Death is especially close. We pause at a burning patch of land surrounded by temples and huge piles of firewood. 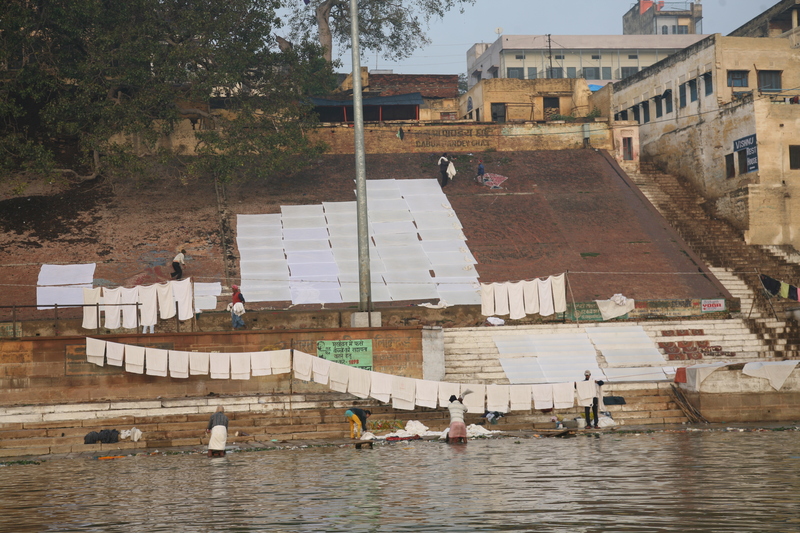 This is the burning ghat, Manikarnika. Babalu points to five or six sombre-looking men carrying a bamboo stretcher on their shoulders. “Look there’s a dead body,” he shouts, and Ashish enthusiastically joins in, directing us to look at a corpse shrouded in white. It seems as though they think that’s what tourists like me come here to see. “This is the place Hindus come for liberation from the cycle of life. The cremation ghat are busy 24/7,” Babalu says in a savvy tone. I turn my head away. 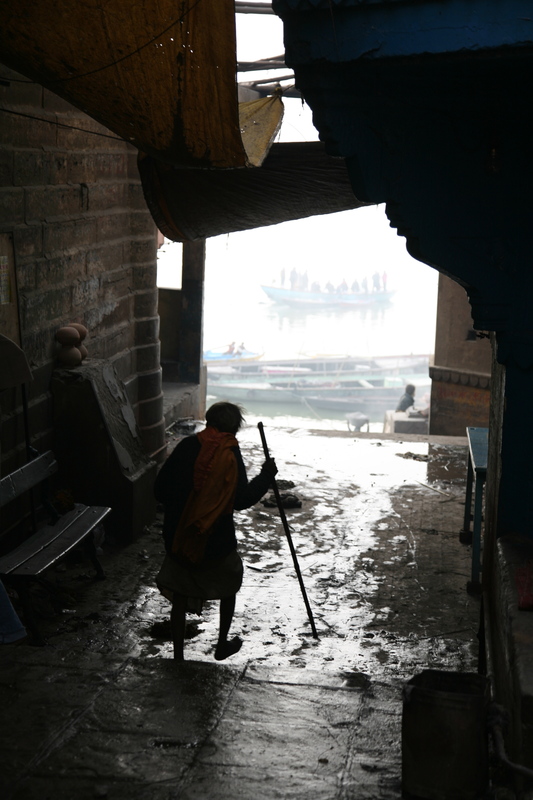 The magic of the Ganges loses its hold, the intimacy of life and death is too raw. “I rather like the matter of fact-ness of it all,” Ross surprises me by saying. But I have to work hard to try to set aside the ever-present death, poverty and filth in Varanasi and hold onto the beauty of spirituality felt here. 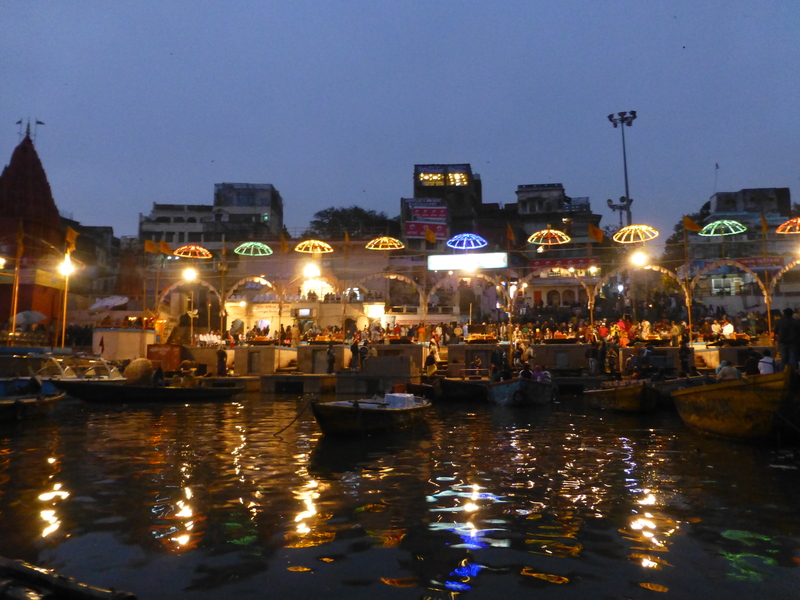 The river is crammed with boats like ours; there is no more room for people to sit (or stand) on the massive ghat. The Aarti Puja ceremony we have come to see seems to me like a big glitzy commercial show. And maybe it is, although our trusted new friend Babalu tells us it is his duty as a lay Hindu priest in Varanasi to take his turn officiating at the Aarti ceremony four or five times a year. 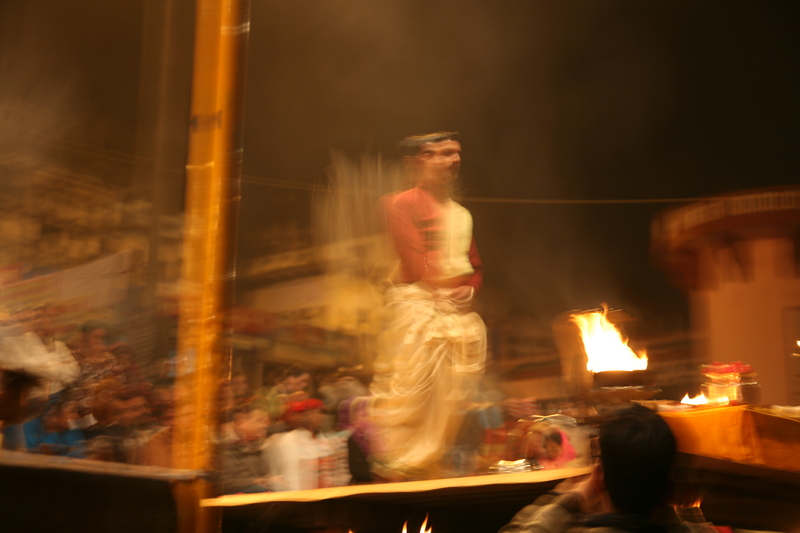 The young priests performing the Aarti tonight are dressed in matching cream coloured dhoti-kurta (skirts and scarves) with flashy deep red shirts and they are swirling giant rings of fire in a cloud of incense and smoke. Some bang cymbals and drums, the volume of their chanting rising to a crescendo. The noise is deafening. Babalu rises above it all and chants Hindu prayers in a loud and fearless voice. I feel “out of sorts.” In the City of Light I’m in a time machine of some kind, zinging from one century to another. In twenty minutes I’ve come from the bedlam of an ancient world with timeworn rituals to a quiet, pristine place. 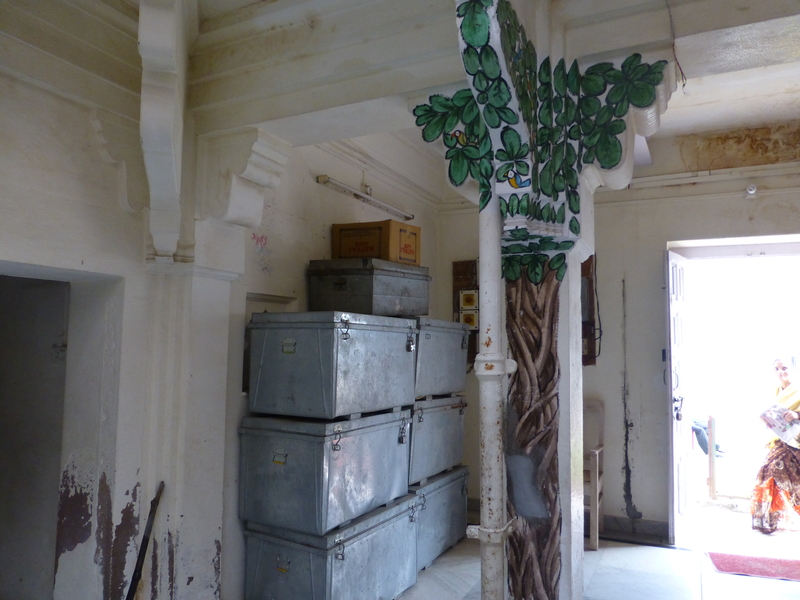 There is nothing out of place in the one hundred and seventy-five year old Nadesar Palace where we are staying but I’m still reeling from the hullabaloo at the ghat. 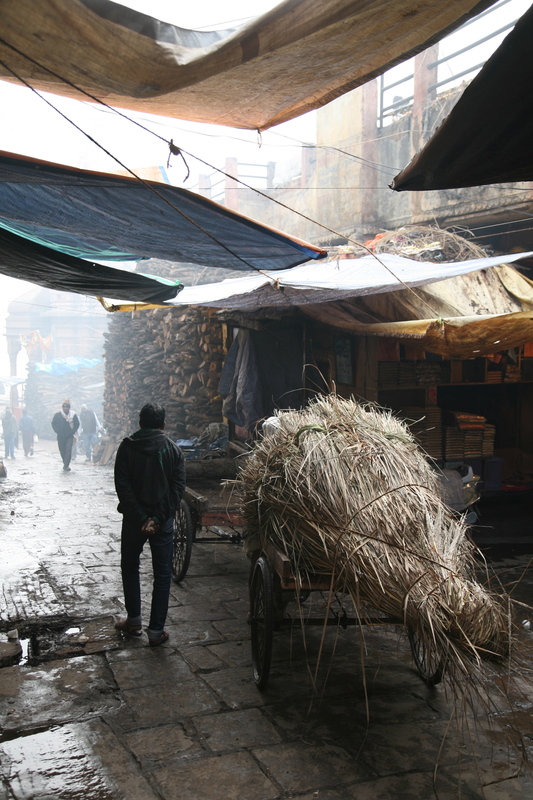 “Varanasi is being buried by poverty and filth,” I had choked out when we left the bedlam. I find myself thinking about my own home and how I reduce, reuse, and recycle. I’m no saint. My own private Puja is hope for the future. I scrub, wash my clothes (including my leather walking shoes) and try to calm down with a glass of Sula, Indian white wine. As the night sky slowly comes to life with stars and planets, the mystical hold of India grabs me again. A curry dinner, prepared especially for us with produce from the palace garden, is delicious and full of fresh herbs, aromatic cumin, turmeric and red pepper. Illiteracy is the main reason for poverty and the statistics are daunting in this area of India. 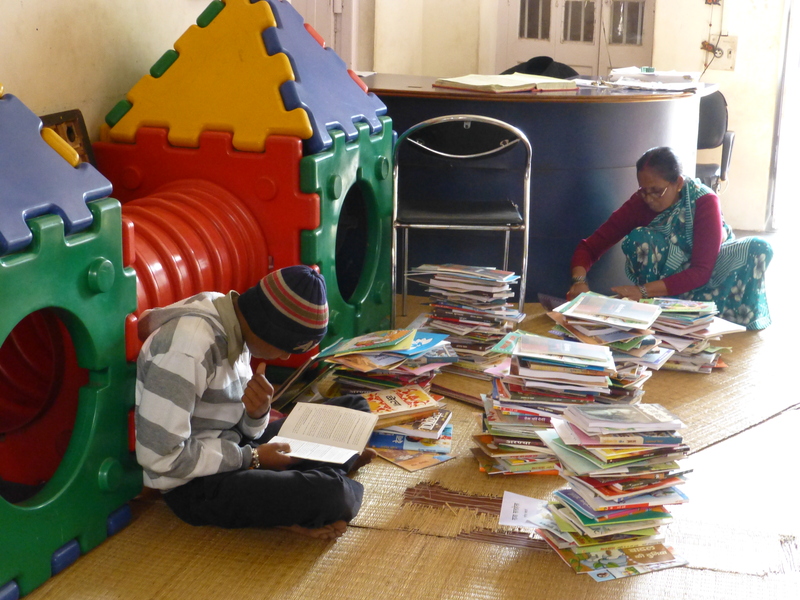 But they also tell a story of improvements in literacy since we visited twenty years ago. I need to take a closer look at Benares to see what’s been happening. Day 2 of Lights Temples and Learning is coming soon. 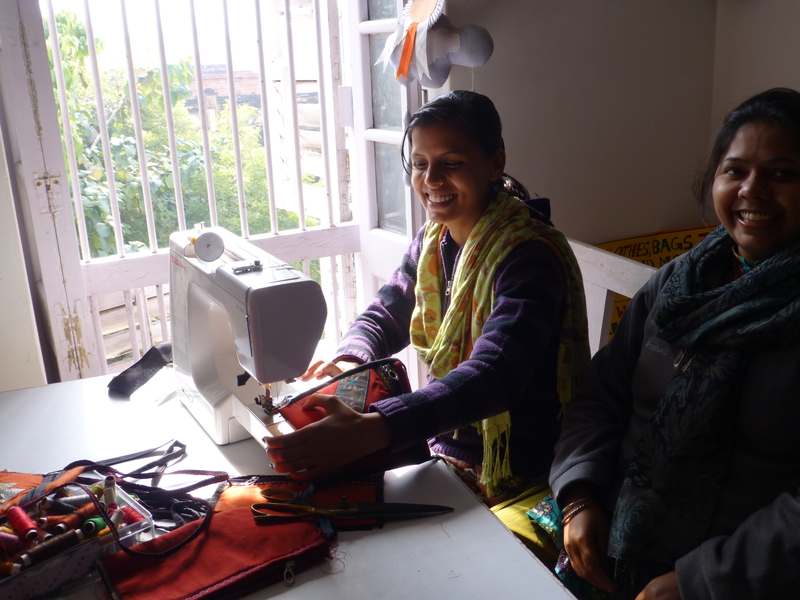 What has been your experience in Benares? Let us know.